Well, then, it’s been awhile! I apologize for that. I’ve been struggling the last few months with depression and some physical issues and it’s taken a lot out of me. It’s the main reason I haven’t done any of my Free Fiction Friday, Otherworld Wednesday (fanfiction), or Manga Monday posts. I’d like to get back to them soon, though. I haven’t been completely unproductive, though! I have been slowly plugging away at my first Omegaverse story! It’s finished, I have the edits back, and I’m (still slowly) working through them. I hope to have it through the proofreaders and to have a cover and preorder before too long. Also, I have some exciting news to share! You might just be… hearing… a certain wolf and his human in audio soon. Yup! 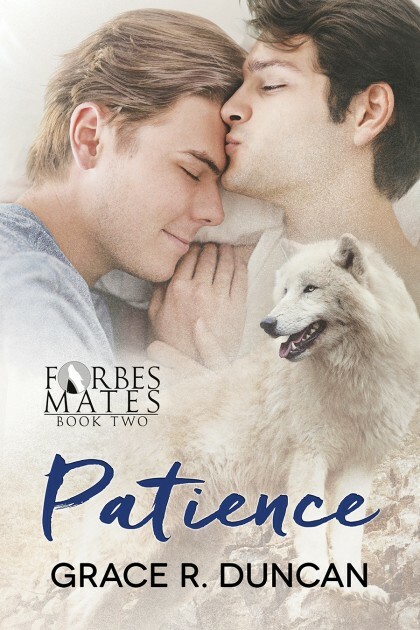 I’m excited to announce that Patience is in the process of becoming an audiobook and, if all goes smoothly, you should see it coming out sometime this month! Eeee! So excited. The narrator, Chris Boucher, has an amazing voice and a lovely version of Jamie. I can’t wait for the final version. Is that I’m going back to school! I had to jump through a few (hundred, it seems) hoops to get here, though. And I discovered I’d run out of financial aid completely. When I heard that, I struggled a bit emotionally and it was part of what brought on the depressive episode. But! It’s easing, in part because I have managed get what I needed to start classes. I still have a few general education classes that Texas requires (and Pennsylvania didn’t, where I got my Associate degree), so I have some leeway working through those at the community college level (which is a lot less expensive than a university!). As such, I will be a bit buried under homework and the like. It’s been *mumble* years since I’ve been on the other side of the teacher’s desk, doing the learning instead of the teaching, and I haven’t had to study for a very long time. I’m equal parts excited and terrified. I look forward to the challenge, but it’s part of what my upcoming delays will be from. Do keep an eye out here, though. I hope to get back to posts and releases as soon as I settle into school and am a little more confident I can handle both.